When an electron beam interacts with a material, a multitude of processes occur which are employed for various kinds of microscopy. 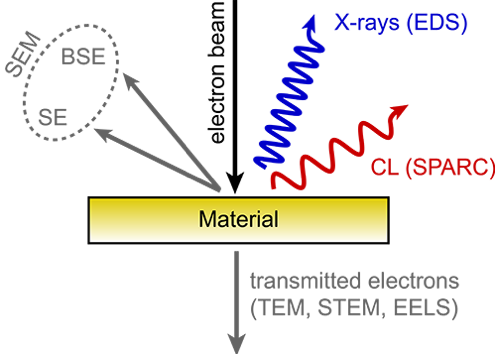 Besides electron signals, a broad spectrum of electromagnetic radiation ranging from x-rays to the mid-IR is generated through a variety of incoherent and coherent processes. The radiation that is generated in the ultraviolet/visible/near-infrared regime of the electromagnetic spectrum is referred to as cathodoluminescence (CL), coming from cathode rays (fast electrons) and luminescence (light emission). The electron beam causes the material to fluoresce as it returns to a ground state. Cathodoluminescence (CL) is used to characterize optical properties at the nanoscale. Cathodoluminescence techniques analyze the resulting photons that are emitted in the ultraviolet to near-infrared region of the electromagnetic spectrum. The power of cathodoluminescence is the combination of functional optical information with the high spatial resolution of electron microscopy. Cathodoluminescence combines functional optical information with the superior spatial resolution associated with electron microscopy. This makes the technique highly appealing for a large variety of applications and research, especially in the fields of optics research, materials science, and geology. Obtaining optical information on nanostructures with conventional optical microscopy is impossible because optical microscopy is limited in resolution based on Abbe’s law of diffraction. Abbe’s law of diffraction states that two points that are spaced less than d = λ0/(2NA), where λ0 is the free space wavelength and NA is the numerical aperture of the microscope, cannot be resolved by the microscope. With near-ideal numbers, using a blue laser with a λ0 of 400nm and a theoretical perfect NA in air of 1 (although oil immersion apertures can be slightly higher) we are limited to 200nm resolution. This makes conventional optical microscopy unsuited for studies at the true nanoscale. 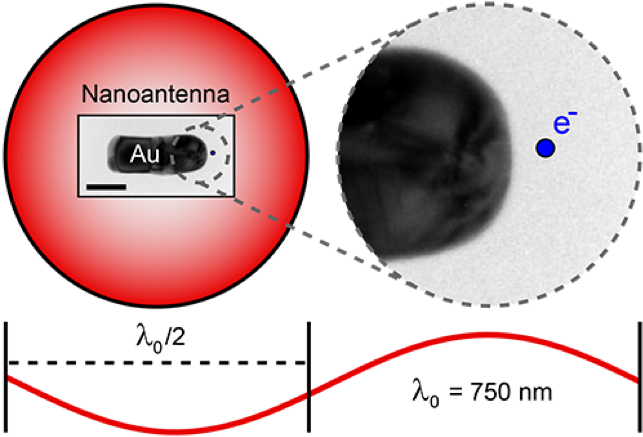 The above diagram includes an Electron micrograph of a 125 nm long gold rod, which acts as nanoantenna and is resonant at λ0 = 750 nm. The scale bar is 50 nm. The overlaid red circle represents an optical diffraction-limited spot for λ0 = 750 nm and an NA = 1. The small blue dot represents a 5 nm electron beam (to scale). A magnified image of the area enclosed by the gray dashed circle is shown on the right. This image illustrates the limits of optical microscopy and the importance of electron beam excitation for studying nanomaterials. The solution to this problem is to use cathodoluminescence, a beam of fast electrons to probe materials at the nanoscale. Using electrons as an optical excitation source has several advantages. First, the excitation resolution can be very high and precise. Typical scanning electron microscopes can focus and position an electron beam with 1 – 10 nm. The beam acts as a probeless, and nondestructive broad band excitation source. Since the measurements are performed in an electron microscope environment the full electron microscopy toolbox can be used to correlate nanoscale geometrical features with the optical response. Cathodoluminescence emission can be used to explore many fundamental properties of matter. It can be used to study light transport, scattering, electronic structure of materials, including semiconductors, (e.g. bandgap, defects), resonant phenomena and much more. It thus presents a valuable source of information for fundamental research as well as applied research with a direct link to industry (metrology, failure analysis). A relevant technology in the field of nanophotonics, CL generates hyperspectral light-emission maps that reflect the local density of electromagnetic states. With recent advances in CL, the directionality and polarization of emission can rigorously be measured to provide insight into the optical properties of nanostructures. Until recently CL was not applicable to metallic, dielectric or most semiconductor nanostructures, but breakthroughs in collection efficiency have made CL studies of these structures possible. Improvements in mirror design and alignment have made advanced CL measurements on previously difficult samples, such as nanoparticles, nanowires, metamolecules, metasurfaces, and photonic crystals possible in off-the-shelf systems. Cathodoluminescence imaging is also an ideal tool to study geological samples. The CL emission from a rock gives insights into crystal growth, zonation, cementation, replacement, deformation, provenance, trace elements, and defect structures. This can be used to fingerprint rocks and reveal interesting spatial textures on a submicron scale. It has proven to be an excellent and non-destructive complement in geochronology to larger and more cumbersome techniques, such as mass spectrometry.